Isekai no Seikishi Monogatari is unlike your typical sci-fi mecha harem anime. It actually features a rather varied compilation of action, slice of life, school, sci-fi, fantasy, military and harem elements all in one series (and it doesn't get messy at all). Kenshi —half-brother of intergalactic hero Tenchi Masaki— has been summoned to the mysterious world of Geminar, and his only hope of returning to Earth is piloting a bio-mechanical weapon in a shocking assassination attempt! When the mission fails and Kenshi is captured, he discovers he's been lied to by the very culprits who transported him to this strange new world. Luckily, Princess Lashara kindly welcomes Kenshi and invites him to live amongst her followers. Now, caught up in a political whirlwind —and hotly pursued by Geminar's female population— Kenshi must find a way to get home while civil war erupts all around him! I had high hopes for this anime and in the end, it delivered what I expected and even more than I anticipated. The story was rather long and was full of lore and scientific jargon; but it was limited to simple, understandable terms for the audience to appreciate. Before I go into details about the story, you might want to know about some necessary background information or else you may get lost. Basically, the world they are on is called Geminar; and like any other world, it is divided by countries. Each country has a limited amount of bio-mechanical weapons. Girls usually pilot these bio-mechas with a few male exceptions (and Kenshi is one of them). Simply put, Kenshi is summoned to this world and the only hope of return is by assassinating the country's princess. However, everything does go go according to plan and he is captured. Luckily for him, Princess Lashara spares his life and welcomes him to live among her followers. This creates some trouble and the country ends up in civil war. The story is quite energetic interesting, and full of surprises. I was hooked in right at the very beginning. The art style was really well done in the anime. The characters all looked great and the environments, mechas and flying ships were unique. The animation was fluid and the presentation was flawless. The battle scenes were simply spectacular. The computer animation used and the various sparkly effects and clashes of swords and the firing of guns was just exhilarating. There was plenty of awesome effects and fan service to be had here. Voice acting was perfect for the characters and I had no complaints about them. I must applaud the appropriate use of background music for various battle scenes since such occurrences in anime is quite uncommon in intense fight scenes. The theme songs were also quite nice and lead into the episode quite well. There were also plenty of sound effects for the various beams, explosions, crashes and metal-on-metal sounds. It was all well compiled. There were plenty of characters to choose from here, and most of them are girls. The main character, Kenshi, is quite an awesome child indeed. He may look naive and innocent but when he gets in one of those mechas, he is one killer machine. It was just awesome watching him leap about effortlessly, slashing and slicing at incredible speed and just mowing down the enemies around him. You could say that is is slightly (or maybe a lot) OP, but you don't get to see him fight till towards the end of the series. Why? If you watch the anime you will find out why he doesn't fight at first. Princess Lashara is your typical down-to-earth money-craving girl that goes to any extent in having her own way. She doesn't really act like a snob, but she does do some crafty things behind everyone's backs like a mischievous child (but she always get caught in the end). As for the other characters, you will have to find out more for yourself! They are quite unique, interesting and very entertaining to watch. Overall, it was an exciting, adrenaline-rushing, and captivating anime from start to finish. The story goes a long way from the start and wastes no time introducing all the characters, the mechas, and the epic battles between factions. It was quite enjoyable to watch and I would definitely recommend it to anyone to watch. The story was entertaining, full or suspense, mystery and action. The art was excellently animated and illustrated. The characters looked great and the environments were highly detailed. The voice acting suited the characters really well and the theme songs were appropriate for the theme. The characters were cute and quite funny to watch. They were all unique, had their own personalities and attitudes. Memorable at the very least. Plenty of fan service in action and comedy. It was fast, fun, and fabulous. 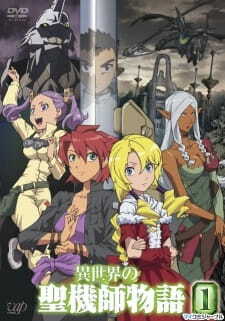 The story is actually quite good and makes you want to know more about the characters and the world that they live in.